The Center to Advance Palliative Care has published a new resource, Serious Illness Strategies, highlighting the benefits of palliative care and sharing a simple framework of six proven strategies to achieving higher quality and satisfaction at lower cost. 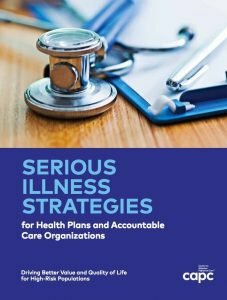 Serious Illness Strategies consolidates best practices gathered from health plans and accountable care organizations across the country. It builds on the foundational Payer-Provider Toolkit, where health plans and ACOs can find examples and case studies across the different strategies. Click here to download this free guide today.